There have been many technological breakthroughs over recent years with regard to security technology that are designed to address the ever evolving needs of businesses to keep their employees, physical assets and I/T systems safe and secure. The highly trained professionals at P4 Security Solutions have many years of hands on knowledge and experience in assessing the security technology needs of corporations. Our technology and cyber security risk assessments are tailor fit to meet the specific requirements of every client’s unique business needs. These comprehensive evaluations look for unseen vulnerabilities, in addition to conducting analysis that measures the effectiveness of current technology utilization, as it relates to cyber threat mitigation and protection against physical threat scenarios. Regardless of the nature of your business or industry, the dedicated professionals at P4 Security Solutions can provide the expert consultation needed to assess whether your security technology is meeting your specific needs both today and tomorrow. 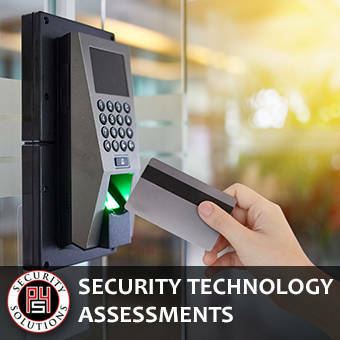 P4 Security Solutions does not sell security technology products, so you can rest assured that our assessments are non biased, impartial and always remain focused on your best interests.